This post is part of our special coverage International Relations & Security . In recent years, major reserves of oil have been discovered at various locations across Africa. If this ‘black gold’ represents an opportunity for economic growth, the fear that the windfall may not benefit the local populations – and maybe even become a curse – is shared by Sub-Saharan African citizens and experts  alike. It is common practice for oil and gas producing countries to negotiate local content agreements with interested IOCs [International Oil Companies] in an attempt to secure for the country a higher share of the value from oil and gas projects. This trend has surfaced as a result of the realization of the poor economic performance of many resource rich countries despite their vast wealth. 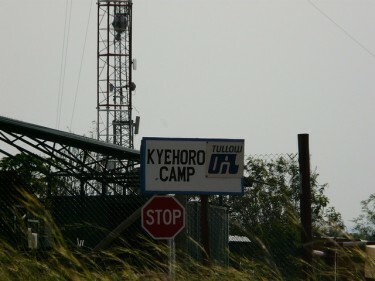 Tullow oil camp, Uganda. Image by Conservation Concepts on Flickr (CC BY 2.0). As part of measures being undertaken to put in place the framework for Ghana's oil and gas production, a Bill entitled the Ghana Petroleum Regulatory Authority (GPRA) Bill was released in October 2008. (…) Sections 100 to 105 inclusive of the Bill deal with the promotion of local content, specifically, the involvement of the state oil company, provision of goods and services by local entrepreneurs, as well as the employment and training of citizens of Ghana. The adoption of the local content policy framework in Ghana followed in 2010 , however it is still pending parliamentary endorsement . The latter is now more urgent than ever, as finding employment is a preoccupation for an increasing number of Ghanaian citizens. Oil brings in huge amounts of money, of course, and along with that come expectations of many, well-paid jobs. The problem is that the industry – at least as it exists in Ghana now – doesn’t generate much work. (…) We’ll have to wait for details on how the government intends to increase local content and participation, which is easier said than done. Training, education, quotas, regulation, penalties, taxation, incentives – the government has multiple options for addressing the question. Uganda wants a strong local content in the nascent oil and gas industry for its citizens to gain skilled manpower and a competitive supply edge. This is in an attempt to ensure revenues trickles down, averting the resource curse. Indeed, avoiding the oil curse is important for Uganda, particularly if it helps to prevent the emergence of other Joseph Kony - like characters. Petroleum was, after all, discovered in the north-west, near the border with the Democratic Republic of the Congo, the epicenter of the 30 year long conflict led by the Lord's Resistance Army chief. A local content policy would hopefully create employment for local populations and distract them from the path of war. The biggest -but most important- challenge is to build and maintain good institutions. (…) transparency will be the most powerful lever for accountability. If Kenyans know exactly how much oil is being produced, how much royalties oil companies pay this would already be a major step in the right direction. (…) Kenya’s strong civil society and creative industries, especially in ICT, can play a strong role in monitoring the oil revenue flows and proposing solutions on how to spend the money well. Then the resource curse can be turned into a blessing. This post and its translations to Spanish, Arabic and French were commissioned by International Security Network (ISN) as part of a partnership to seek out citizen voices on international relations and security issues worldwide. This post was first published  on the ISN blog , see similar stories here .